The Story of a Round House and Other Poems (1912, with new and revised edition in 1913) Includes "Dauber". Good Friday and other poems (1916) Includes the dramatic poem, "Good Friday" followed by numerous sonnets. 'Masefield, John', The Year's at the Spring, 1920. Illustrated by Harry Clarke. Sea Fever p. 41; Tewkesbury Road p. 43; The West Wind p. 45. "The Choice", p. 133; "The Island of Skyros", p. 380. 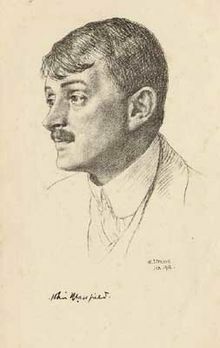 ↑ Contains all poems from Sonnets and poems (1916), and all but two poems from Lollingdon Downs and other poems (1917). Added is one poem entitled, "The Ship" (which has an alternate title of "The Ship and Her Makers" in other volumes). The 'missing' poems are "O wretched man, that, for a little mile" and "Night is on the downland, on the lonely moorland".